Barbara Jane Reyes was born in Manila, Philippines, and raised in the San Francisco Bay Area. She received her B.A. in Ethnic Studies at U.C. Berkeley and her M.F.A. at San Francisco State University. She is the author of Gravities of Center (Arkipelago Books, 2003) and Poeta en San Francisco (Tinfish Press, 2005), which received the James Laughlin Award of the Academy of American Poets. Her third book, entitled Diwata, is forthcoming from BOA Editions, Ltd. in 2010. Her chapbooks, Easter Sunday (2008), Cherry (2008), and West Oakland Sutra for the AK-47 Shooter at 3:00 AM and other Oakland poems (2008) are published by Ypolita Press, Portable Press at Yo-Yo Labs, and Deep Oakland Editions, respectively. Her poetry, essays, and reviews have appeared in Latino Poetry Review, New American Writing, North American Review, Notre Dame Review, XCP: Cross Cultural Poetics, among others. 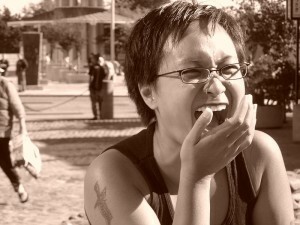 She has taught Creative Writing at Mills College, and Philippine Studies at University of San Francisco. She lives with her husband, poet Oscar Bermeo, in Oakland. LR: I wanted to start by talking about history, which is something that figures strongly in your poetry—for example in Poeta en San Francisco we see historical references mixed in with local references to San Francisco (SF) and the Beat Movement. Can you start by talking about how both history and geography are incorporated into your work? BJR: I grew up on the periphery of SF, meaning that I lived in the East Bay for most of my life in this country. The more I came to see other parts of the country, I realized that there’s something interesting about SF and its history of people coming from so many different places and colliding with one another. I know this happens in every major American city, but for me SF has this unique place on the cusp of the Pacific Rim […] When the westward movement got to the Pacific Ocean, it just kept going into the Pacific. Just think about major American wars in Asia in the 20th century, and SF being a very important strategic point, and then Honolulu, and then Manila. What that means for all those people that get cast aside and spit out of that system is that they all end up with this baggage that they’re aiming at one another. That’s SF for me. LR: And in your own personal history when did this dawn come? BJR: It really did happen in college, as an undergrad at UC Berkeley. I remember reading Frederick Jackson Turner’s “The Frontier Thesis,” where he talks about the American identity—and here he really means the masculine identity created as these men are forging West and dealing with the landscape—that makes the American man different from the English colonial subject. What my professor argued was that the wars in the Pacific, starting with the Spanish American War and the Filipino American War, were an extension of that creation of the masculine American, because there wasn’t anywhere else to go but the ocean. The Philippines were seen in the Filipino American War as the starting point for America to get into China and start its own empire. When I was hearing these things lectured to me and as I was reading about them, what I was seeing in SF started to really make sense—what I was witnessing and experiencing as a Filipino girl growing up in the Bay Area, not being able to find any evidence of long time Filipino settlement there, even though now I know that there is a much longer history. I always kind of felt like that there had to be some reason why so many of us just kind of got plopped in the city. And a lot of it had really to do with that movement into the Pacific once the frontier ended. LR: When you write this poetry, how do you think about how people who are not as deeply entrenched in this history are going to read it and understand it? BJR: I think that there are enough concrete colors there. I think about this, for example, when I’m in the Mission District walking around the mission. I spent a lot of time there because I had done a presentation for one of my Native American Studies courses on sacred spaces, the idea of the mission and the mission system. We all see these symbols and these landmarks, so there are always these points of geography to grasp onto, whether or not we know the specific history behind them. I think that when folks come to the Bay Area, they may or may not know something, for example, about Angel Island. But it’s a big rock out there in the bay that they can find out about. They may or may not know something about the I-Hotel, but they can go visit it. I always kind of hope that poetry will make or compel people to research farther or think about these things farther. I hope that maybe deep in their consciousness, it will alter something that they have previously taken for granted or haven’t thought about. I feel like as long as I am not making up any of these historical references and that they are actually there and verifiable, that it will hopefully encourage a reader to stop and think next time he or she is walking up to North Beach to hit one of these nice touristy traps–the I-Hotel is right there! Just stop and look at it. LR: And so these physical reminders of history are actually very important to you. BJR: Absolutely. I think a lot of it has to do with monuments and my own search. Like a lot of Filipino Americans I knew growing up in the Bay Area, we were always searching for monuments, and feeling like we weren’t finding them. Monuments to our communities. We didn’t know where to look. And you know, the monuments really are there–we haven’t been completely wiped out. There is evidence of our having been here since the turn of the 19th-20th century. I hope part of what my poetry is doing to is to point them out. LR: I want now to jump to some of the concerns you’ve written about on your blog. Recently you addressed translation, and asked yourself how one can or should critique translated poetry when you don’t know the language yourself. Some have responded by asking how your books, which incorporate Tagalog, should be read by non-speakers. What are your thoughts on that now? BJR: I think that in my mind there is a difference from, let’s say, the poetry of Lorca or Neruda that was written entirely in native tongue. I guess we can say that Poeta is written in my native tongue, if my native tongue is code switching. My family and I have a very pragmatic system of communication that is mostly in English, or not–it just depends on what is the most efficient way of being understood. So it isn’t quite English and isn’t Tagalong–but what is it? I speak in this code switch language. Of course I think that the primary text of Poeta is in English, and the Tagalog adds another layer to how we think of English. What is English? You go to any part of United States and a different kind of English is being spoken there, and we shouldn’t be invalidating anybody’s English. The English of the Bayou and the English of Chinatown and the English of East Oakland are different things altogether, but we find ways of understanding one another because the goal is communication. I think that if the goal is communication and poetry for me is just a form of communication, then we will try to be understood and understand one another but also be true to and honor that language that defines us, or that language that we truly speak. Ultimately this is about whether as a reader we can trust that the poet is really trying to communicate something to us. I think that there’s a lot of suspicion surrounding hearing a language we do not understand. Can we not step back from that and say that there’s a system of communication happening here that delineates a community, and [if] so how do I expand my community such that someone who has hardly ever experienced Tagalog can possibly find a way in, despite some sections of a 109-page book that may be in a language they’ve never seen before? There’s all this English and all these concrete cultural references that you can anchor yourself to as a reader. LR: While on the subject of different Englishes, I read this from your recent blog post: “As Filipinos, we have a loaded relationship with the English language, which I believe is why we pun ‘bad’ English, deliberately mispronounce and redefine English words. These are some ways of claiming ownership over the language, and isn’t it great, how we empower ourselves with the ‘master’s’ language.” So bilingualism or pidgins seem more than just by-products of the need to communicate, but can be acts of rebellion or activism. How accidental or deliberate do you really think this is? BJR: I think initially, a simple acknowledgment of multiple Englishes, hybrids or pidgin can be considered some kind of rebellion or even activism in that it decenters standard or proper, English or institutional English. Lee Tonouchi’s work, Living Pidgin (Tinfish Press, 2002), is a pretty comprehensive volume on the matter of pidgin and activism. I do think we should consider that activism is involved in fulfilling the need to communicate by creating a new or hybrid language and system of code switching. It isn’t just a by-product. As well, I think recognizing the need to communicate and understand one another across multiple communities is pretty important. This is how we begin building coalitions. LR: And that brings us to activism and building community, in the more literal sense. Is activism different for us as minority writers? Is it more important? And what about those who want to be seen as writers in their own right, apart from their ethnicity? BJR: I feel like we just have to do the double work. There might not be any way around it. I really do feel like if community and forwarding our work as a community of artists is important to us, then the concrete work that we do as folks who head community arts organizations–as editors, publishers, and mentors–that work is indeed activist work. And I’ve chosen to do that on top of the fact that I want to continue writing books. I love the idea having a professor contact me out of the blue and say I have X number of students reading your work, can you come in and talk? I want to walk into a classroom where they’ve never read Filipino lit before and have them ask me a million quesitons about my book. LR: Speaking of that, you recently mentioned in your blog you’ll be teaching yourself in class. Have you thought about already what you’re going to say about yourself? BJR: I think it will probably be okay … I guess it was different when I walked into Ronald Takaki’s Asian American history class and we read his Strangers from a Different Shore or another classic, like when we read A Different Mirror. It was fine, because he was one of the authorities on Asian American history. So I guess I’ll just have to have that confidence in myself as one of the authorities on Filipino American poetry, and be academic about it. LR: How does it feel to be considered such an authority? BJR: I’ve always been in this leadership position just because my name has been out there as an author for a while. But it was even prior to that, really starting with my years with maganda magazine, which was so important for the local community here. It was so important that elder Filipino American poets, really folks I look up to very much, found me and my colleagues. They were so thrilled to see this younger generation. I started on the local spoken word scene, so I was always visible to some community of Asian American or young poets of color and I was called upon a lot to shout poetry on megaphones at political rallies and that kind of stuff. LR: Is your role as an authority or a leader in this community different from that of your predecessors? BJR: I believe in concrete support, as in how can I be concretely supportive of young Filipino poets or young poets in general who are looking at what I’ve done in my career as some sort of blueprint for theirs. What am I going to do as a mentor, somebody who edits publication, somebody who curates a reading series, or somebody who can write letters of recommendation for an MFA program? So I think that’s a lot of it right there. Two of my poetry mentors, Jaime Jacinto and Eileen Tabios, were hands on. Whereas I consider the monumental community figure like Al Robles to have been inspirational (because of his poems, the subject matter of his poems, and his community work; his poetic and political practice were the same thing), Jaime and Eileen gave me a lot of one-on-one concrete literary advice about where to submit my work, which poets to read; they asked me hard questions about what I wanted my poetry to do, and advised me accordingly. Both have also read my manuscripts in progress and given me feedback on these. These two also brought me into literary reading venues and as editors, into publication. So, following the lead of these two, as an editor for various poetic projects, I’ve tried my best to open up the publication space to younger API and Pinoy/Pinay poets; in the past I’ve included the poetry of Ching-In Chen, Debbie Yee, and Sasha Pimentel Chacon in OCHO. Yee’s poem, “Cinderella’s Last Will and Testament,” ended up in Best American Poetry 2009. Two of my forthcoming guest editor projects, In the Grove and Blue Fifth Review, will include poems by Niki Escobar, Rachelle Cruz, Sean Labrador y Manzano, Gizelle Gajelonia, Yael Villafranca, and Allison Moreno. I have a couple more editing projects up my sleeve, in which I plan to continue opening up that publication space to emerging writers or color. LR: Can you talk about your invovlement with Philippine American Writers and Artists (PAWA) and Arkipelago, and highlight for us some of the upcoming events? BJR: My current involvement with PAWA has been as a board member, curating our reading and workshop series with Edwin Lozada. In this capacity, I’ve been trying to provide literary reading space to writers in the community, both established and emerging. I’ve always valued the live reading as a crucible, a place to try out new work in progress, a way to refine the work. On June 5, we are teaming up with Eth-Noh-Tec for an evening multidisciplinary performance and storytelling. Featured artists are filmmaker Nara Denning, theater performer Sean San Jose of Campo Santo, poet Aileen Ibardaloza, musician Ron Quesada whose Kulintronica is blend of Southern Philippine kulintang and electronica, and theater performer/stand up comedian Allan Manalo of Bindlestiff Studio. LR: You mention bayanihan in your blog. What does that mean? BJR: Bayanihan is a Tagalog word that means something to the effect of ‘the spirit of community’. Bayan refers to a nation or community. So bayanihan means the spirit of community to achieve something, like some kind of goal. LR: And so when you think of bayanihan for the Fil Am or AA poetry community, what might those goals actually be? BJR: As an author, major goals are publication and book sales, not just for myself individually. I want to see more APIA and Filipino American authors’ books in print, a diversity of voices. I encourage more writers to polish and submit their manuscripts to publishers, and to do so in a focused manner. I’m a strong supporter of independent publishers, because there are many with admirable mission statements about ethnic, political, and aesthetic diversity. Nick Carbo told me years ago that one of the best way to bolster book sales was through course adoption. Experientially, I agree with him. That said, I want to see our literature taught widely. Outside of academic settings, I haven’t figured out yet how to make our books appealing to the greater APIA community, i.e. those outside of activist, artist, academic communities, or how to effectively bridge that gap. This is a work in progress for me. LR: Lastly, can you tell us a bit more about your upcoming book, Diwata? Like your other books, it will be incorporating history and themes of historical dislocation. But in what ways do you think it will depart from your first two books? Perhaps start by telling us about the mythological, creationist (or re-creationist and rebirth, as it were) aspects of the book? BJR: The way I’ve come to think of Diwata is like this: in my work, there are themes I’ve previously tried to address, for example, as you mention, the recurring theme of dislocation. It’s taken on some mythic qualities in my first two books, but I think only in glimmers, this mythical or mythological tellings and retellings of dislocation. Diwata became the space for me to blow it up. While wary and critical of contemporary reclaiming of pure indigeneity as appropriation, I am still interested in possible ways indigeneity morphs and endures in our urban, American everyday given Western conquest, diaspora, transnationalism. Does such a thing exist without going native, without forwarding a new noble savage? If so, how? What changes, how does it change?